With all the snow lately, I don’t think Spring is anywhere in sight yet. Despite that, I’m definitely in Spring mode and am so ready to transition to my Spring capsule wardrobe. Before I share my inspiration for Spring, let’s take a look back at my current Winter capsule wardrobe. If you read my post about my Core Capsule, you would know that I have a basic capsule that I wear year-round and then I add on a seasonal capsule that has more appropriate pieces for the particular season I’m in. I’ve found this to be helpful especially living in Canada since we have very distinct four seasons. Pictured here is my Winter Capsule that I’ve been styling and wearing for the past few months. In this capsule I included lots of chunky knits, some wool pants, a few cardigans and shirts. At the end of a season, I like to go through my capsule and decide which pieces are staying in my closet and which pieces, if any, need to go. This may seem like a tedious process but it’s actually rather fast and can be helpful for you to identify which pieces you are actually wearing. Although I have a relatively minimal closet, there are still pieces that don’t get much wear. This winter season, I picked out three pieces that didn’t get as much wear as I had hoped. 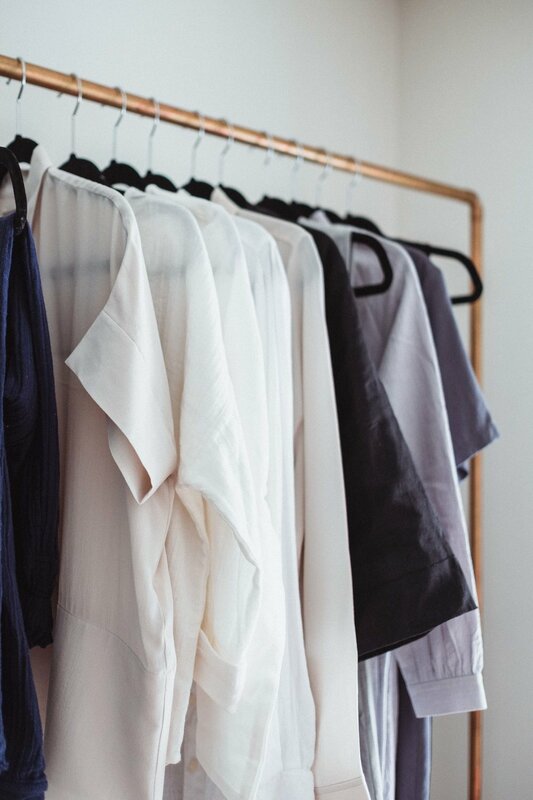 There may be many reasons why pieces in your closet aren’t worn as much. For me it mostly came down to material and practicality of the pieces. The three items I decided to take out from my winter capsule are: a denim shirt, a black cardigan, and an olive knit. denim shirt: This denim shirt is made of cotton and although it’s a great piece, I just found myself gravitating to my dad’s old denim shirt instead. This light denim shirt that I had in my winter capsule is a lot more structured and a tougher material. I think the reason why I often chose my other denim shirt is because of comfort. black cardigan: This black cardigan I’ve had in my wardrobe since my uni days was once a really well-loved piece in my wardrobe. This season however, I didn’t find myself wearing it much. Again I think the reason is because of comfort and practicality of the piece. It fits a little tighter on the arms whereas I often like to choose more oversized pieces. olive knit: This olive knit, though a beautiful design and fit, is just plain itchy. This is probably the only knit I have that I find itchy. The reason this didn’t get much wear is fairly obvious - it was just not comfortable to wear because of the material. 3. declutter or give it another go? Next I decided whether I would declutter these low-wear items or save it and give it another chance. For these three, I decided to declutter two and save one. I’ll talk more about declutter sustainably another time! After living in my core capsule and winter capsule for a season, I decided to make some changes to my core capsule. This is probably going to continue to change as I live with it for a longer period of time. It’s still something I’m experimenting with. In my core capsule, I had a ton of turtlenecks which I find I wear a lot in the winter, but as I think about spring and summer, I don’t think I’ll be wearing those at all. I also had two tank tops in my core capsule which I wear a lot in the spring/summer seasons but I didn’t wear at all in the winter, so I think I’ll be taking those out of my core capsule. Those are probably more seasonal items that should be added to the season specific capsules. I’ll just do a bit of shifting with my core capsule pieces. My Core Capsule now stands at about 15 pieces made of mostly denim and trousers that are worn year-round, a white and a black tee, and a few other basic pieces. Now after all that talk about my winter capsule, let’s dive in a little into my Spring Inspiration. I’m foreseeing that this may be a long discussion so I’ve broken it down for you in case you want to jump straight to a particular topic. I first start off my slowly gathering inspiring images on my Pinterest board. I received many questions on Instagram asking how I decide what to pin and how I choose pieces for my capsule. It’s not as complicated as it may seem. A capsule wardrobe is just about choosing the styles you love and want to wear, after all, it’s your closet. That’s what I love about fashion, the ability to be creative and expressive with beautiful garments. So the main point is not to stress over whether the piece is right for your capsule wardrobe, you’ll know if you like something. I personally have a few guidelines that help me decide what to pin and choose for my capsule. These guidelines are things that just came naturally to me and I have found for my particular style, that it helps me have a consistent and functional style. For example, if you take a look at my board, this season I’m really loving the whites and soft linen materials. However, if I was at a different stage in life, maybe with kids, I probably wouldn’t choose as much white or silk materials because those are delicate fabrics that would probably get ruined. For winter I chose a lot of wool and cashmere, thicker materials, and for Spring, I’m looking at a lot of linen, tencel, and cotton materials that are more breathable for the warmer months. The reason I do this is so that I can be inspired to style something I already own in various ways. Maybe you’ll come across a particular outfit that you love with a piece that you already have and it could inspire you to wear that garment a different way. You’d be able to recreate a look you love with what you already have. This one is so simple. I often just pin photos that inspire me or is a style that I am trying to achieve with my own wardrobe. This season I’m really inspired by lightweight, organic materials such as linen and cotton. I love the laidback, natural toned outfits. Colours that I’m really drawn to are whites, beiges, tans, with pops of burnt rust and denim. I love a lighter more neutral colour palette for the warmer seasons and they also pair well with my basic colours of black, grey, and navy that I wear a lot. Style-wise, I’m inspired by oversized, light-weight cardigans as well as button-downs and wrap tops. I’ve made a simple wish list that may or may not be filled during the season, but either way, it’s nice to be intentional about what I may want to bring into my wardrobe this season. I love making Pinterest boards and find them very helpful when putting together capsules for different seasons. I hope you’ll take a look through my Pinterest board and see if anything inspires you to create a mood board of your own! How do you determine what goes in your capsule? Similar to my style guidelines, I decide whether something goes into my capsule first based on functionality and comfort. If the piece isn’t practical, I probably won’t wear it. I also consider fit, which is related to comfort. If something doesn’t fit properly or isn’t the right size, I probably won’t wear it much because it will be uncomfortable or it will look strange on my body. For Spring and Summer in particular, I’ve been trying to be intentional about including more pieces with natural fabrics like linen, cotton, and hemp. Materials are definitely something I consider before bringing something into my seasonal capsule. Finally I always think about longevity and versatility of a piece. Can this piece be styled in multiple ways? Is this piece bad quality? Will this garment break down after a few wears? Is this a classic style or is it a trendy piece that I’m not going to like after one season? Not to say, you can’t include trendy pieces in your wardrobe, I personally love a classic, minimalist aesthetic, but there are definitely still some trends that I give into. For example, the wide leg pant. If you look at my board, you can clearly see I’m in love with wide-leg pants haha! In summary, consider functionality, versatility, fit, material, quality, and longevity. How do you create a capsule for your body type? I get asked this question quite frequently and it’s actually a difficult question to answer because I can really only speak for my own body type. I think this is somewhat related to my style guidelines of functionality, versatility, fit, etc. Creating a capsule should not be any different for someone with my body type or someone with a different body type. I personally create a capsule that I will always want to return to so, I build my capsule in a way that fits my lifestyle, versus trying to fit trendy pieces, that may not look good on my body type, into my wardrobe. For example, I will probably never wear low-waisted pants again, whether they come back in trend or not, simply because I don’t find them comfortable. It all comes down to wearing what is comfortable, functional, and makes you confident. 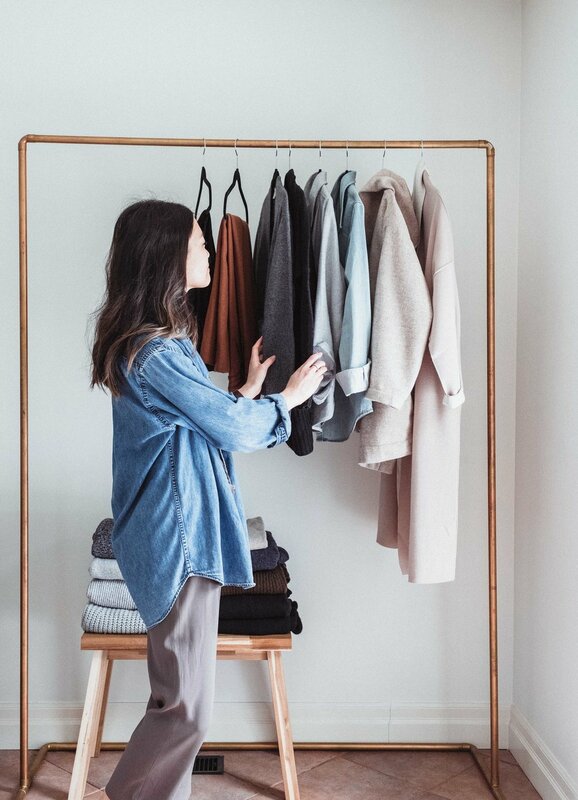 I think ultimately you don’t make a capsule wardrobe for others, or even for social media, you make it for yourself. I’m still working on it and things may change, but for now here’s a little sneak peek at some of the items I’ve chosen for my upcoming Spring Capsule. Do you want to see a full break down of all the pieces? Alright, you’ve made it to the end. There were some other great questions and suggestions, but I think I will have to continue those conversations in another post or this is never going to end haha! Let me know if you want me to discuss anything further or if you have any other suggestions or things you’re curious about. As always, thank you so much for your support and constant encouragement as I continue to explore this sustainability journey.